A more considered version of the experiment initially run in the previous post.This time, there's a new bit of code that mixes Photoshop Actions. In turn, these run other modular bits of code for the Spot and Stripe Patterandom scripts. 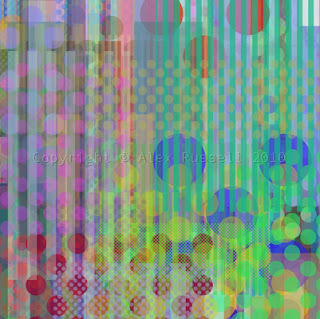 The code stopped every 20 new Layers (10 stripes, 10 spots) and I altered the boundaries within which the patterns could be randomly scaled. This was done sequentially at first and then in response to how the design looked in order to try and get a balance between large and small scale pattern. As with the previous post, this means a result that is not truly generative. I'd like to look at how decisions about when to stop or alter things are made in more detail as this project unfolds. I have a vague idea for a manifesto of some sort that says the final designs have to look good. However interesting the code is that creates them, it's not interesting enough if the results aren't beautiful.